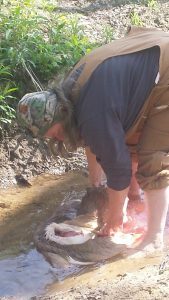 Rinsing the freshly skinned hide of a road killed deer. 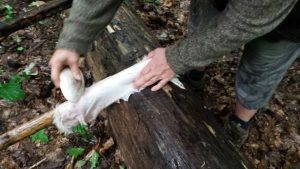 Using a clam shell scraper to flesh a rabbit hide. My friend Eric using a fleshing beam and scaper to flesh a road killed deer. 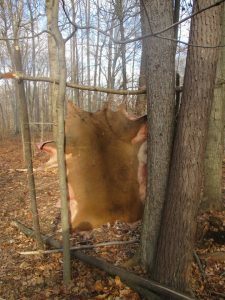 Deer hide racked to dry scrape. And why would you go to all that trouble? So you can make a beautiful buckskin outfit like my friend James. 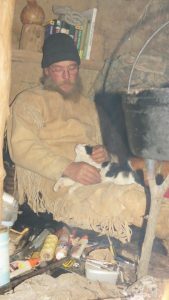 That’s his little buddy Luther on his lap who lived with him in his Earth lodge for a year.